Most importantly here are Bel Powley, Richie Merritt and Matthew McConaughey’s performances. Based on a true story, ‘White Boy Rick’ centres on the relationship between a blue-collar father (Matthew McConaughey) and his teenage son (Richie Merritt). Rick Wershe Jr. became an undercover informant for the FBI during the 1980s and was later arrested for drug-trafficking. 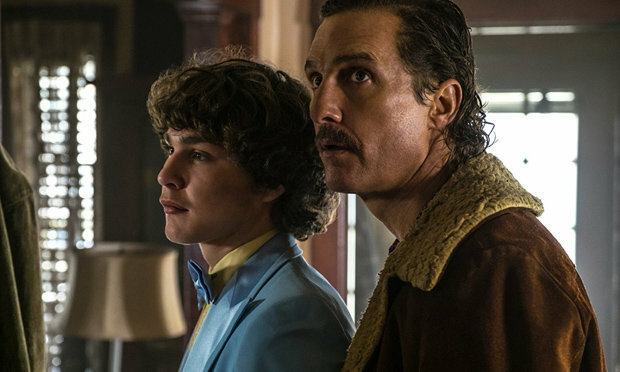 ‘White Boy Rick’ opens with a striking sequence in which a father and son haggle over guns. They know their stuff and won’t be tricked, and manage to procure a good deal. Back home, the dysfunction of the family is made apparent. We find the daughter of the family, Dawn (Bel Powley, who is going up and up in her career right now), in bed with a man and high out of her mind. She screams at her father that he is the reason her mother left and runs down the street after her lover leaves, crying and calling hysterically after him, dressed in just a t-shirt and underwear. These forceful visuals grab the viewer’s attention from the get-go. Aside from the family dynamic, the story focusses on the rise and fall of the titular character, played appropriately coolly by newcomer Richie Merritt. Rick idolises his father, who sells guns illegally, and seeks the status and influence of him. However he yearns for more than his dad, and sidles into crime by making allies with local black drug dealers. Of course, once he is drafted into police undercover work, the work becomes much deadlier. The story, dialogue, pacing, score and acting are all on point. Yann Demange showed his strength as a director with his debut feature, the Troubles-set thriller ’71, and continues to develop his auteurist style here. The movie thematically recalls ‘Top Boy’ in particular, the series which allowed Demange to really start making a name for himself. At the same time, there are some issues with ‘White Boy Rick’, especially in relation to the character of Richard Sr. His criminal connections and motivations aren’t delved into as they should be which makes the police’s threat to Rick Jr. that they’re going to put him in jail perplexing. Still, the film gets a lot of things right, especially given it essentially consists of two halves which it has to make flow correctly. Its story of gangster life and a betrayed informant aren’t anything unique, but the father-son-daughter relationships give the plot a fresh dimension which an audience can emotionally invest in. Most importantly here are Powley, Merritt and Matthew McConaughey’s performances. The latter hasn’t really had a box office smash since 2014’s ‘Interstellar’, or a critical hit since his Oscar-winning turn in ‘Dallas Buyers Club’, but his performance here recalls ‘Mud’, which hailed the McConaissance. As his character’s situation becomes especially desperate in act three, you’re reminded of the star he is.